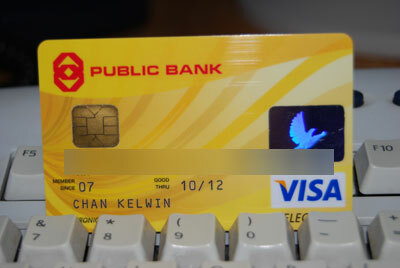 I got my Public Bank Visa Electron card early this month. The first thing that came into my mind was to withdraw my PayPal funds immediately. Just when I was about to withdraw my PayPal funds, I notice that my name printed on the screen (full name) doesn’t match the name printed on my debit card (partial name). I looked for an option in the system to edit my name printed on the screen to reflect the one in my card. There isn’t such an option but I found something else instead. I noticed the phrase, “Expanded Use Number needed” for my debit card. I was worried that my withdrawal will be rejected if I do not complete the expanded use option first. That is why I postponed my withdrawal later. A few days later, Joyce mentioned that her PayPal withdrawal was successful even without completing the Expanded Use process. That is when I immediately made my withdrawal. I applied for Public Bank E-banking service and opened a savings account. That way, my e-banking application can be approved immediately. I was told that applying for the e-banking service for the debit card only may take weeks to complete. Anyway, the advantage of connecting the savings account and the debit card is that I can transfer funds from the savings account to the debit card (and vice versa) easily. To top it up, it is free of charge. To date, I have made two withdrawals from PayPal successfully. The first withdrawal was on the 12th November and the second one five days later. Both transactions were approved without any problems. The conversion rate for the first withdrawal is 3.3068. That is very low. The conversion rate for the second withdrawal is 3.3285. The difference is about RM10. Withdraw $500 Or Not To Withdraw? Earlier, I read some concerns about withdrawing big amounts with a new debit card from PayPal. The advice given was to withdraw small amounts first and to make some transactions with the debit card before withdrawing. In my case, I made two big withdrawals without any problem. However, as Hongkiat puts it, getting your PayPal account limited is like having chicken pox. You are sure to get it. Therefore, do not allow it to disturb you too much. Just withdraw your funds like how you would like to do it. It is advisable to withdraw a maximum of $500 each time (or as much as you have) to save on the $5 transaction fees incurred for each withdrawal. $5 is about RM17. Think about it. This post was written and saved as a draft for two days now. Instead of editing it, I will just post it up as it is. …I was fast asleep (probably with saliva oozing out of my mouth) well until 7 in the morning. A complete redesign and rebuild from the ground up using the previous model as a reference with additional functions added to the backend of the system. One of the more prominent changes is the new social blog aggregator called innit. innit looks and feels pretty much like Digg. Since this is the initial launch, you shouldn’t expect much (if any) advanced features in Digg that is incorporated in this new system. So far, it works pretty well with all the basic features in place. Digg has its own digg it! while innit has its innit it nang it! If you ask me, I say that the name innit somehow doesn’t feel right with nang it. Maybe the nang it! should be changed to innit or innit be changed to Nang. I don’t know. It just feels/sounds a little strange. Anyway, I got my first Nuffnang check (a few weeks ago)! It is not much but hey, at least I am making some money. Unlike others who place a few banners in one blog, I only place one type per blog. I guess that is why I am not earning as much or as fast as some of my peers. There has been a lot of hoo-haa going on about how Nuffnang isn’t “delivering”. In my opinion, when a relationship doesn’t work out, the problem doesn’t always lie on one side. Both sides have their own part to play. 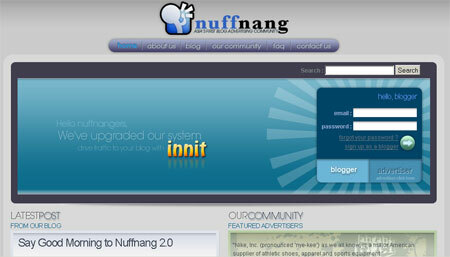 Many also forget that Nuffnang is still considered new and shouldn’t be compared with big timers like Google. I read some people are angry over the fact that when they are not served with ads, the Nuffnang logo is “advertised for free”. If you look back at the earlier posts, this was brought up before. 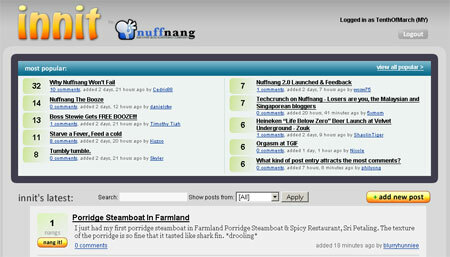 When you help advertise Nuffnang, it gains more exposure. When it gains more exposure, more advertisers will invest thus increasing the chances of you getting an ad. You scratch my back and I will scratch yours. If you don’t like the way it is now and expects a Google Adsense-like experience, drop the banner and join later when Nuffnang becomes bigger. HongKiat tried both Nuffnang and Advertlets at the start but ended up throwing both banners out the window. If you think placing another banner from some other companies at that slot makes you more money, drop the banner. Please stop whining. After eight months running Google Adsense in my blogs, I finally accumulated enough money to make my first cash out last month. 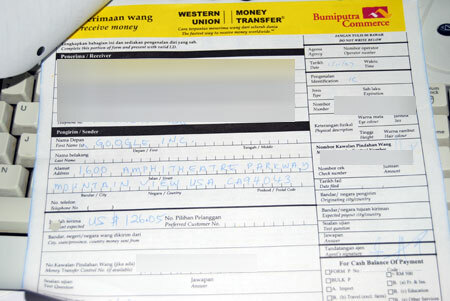 Since one month ago, we are able to cash out our Adsense earning through Western Union. I opted for the Western Union cash out method over the conventional check since it is faster and free of charges. I went to a nearby CIMB branch which has Western Union services to withdraw my money. I requested for the necessary form from the guard. I filled up the form as fast as I could. It is an unbelievable feeling to finally receive some cash from my blogging adventure. I took a number and was served almost immediately. I presented the form together with my IC. My transaction was processed without a problem. You can read LiewCF’s attempt to withdraw his Adsense earnings from Western Union. There are two differences between our individual experiences. Firstly, the counter staff didn’t ask me what the purpose of the money is for. Secondly, I don’t remember her photocopying my IC. However, I was withdrawing RM400 while LiewCF could be withdrawing RM4,000 or more. So, that could be the reason for the differences. Anyway, after doing some calculation, the exchange rate was at 3.3146. Where did you withdraw your Adsense earnings and what was the exchange rate? I suspected my CPU was operating at very high temperatures a few days back. I entered the BIOS to check the CPU’s temperature the next time my computer hanged. I was shocked to say the least. My CPU was running at 70 degrees Celsius! No wonder the heatsink was untouchable. I guess some CPUs are able to withstand slightly higher temperatures but I wasn’t even doing any “heavy” before the computer hanged due to what I suspect is overheating. 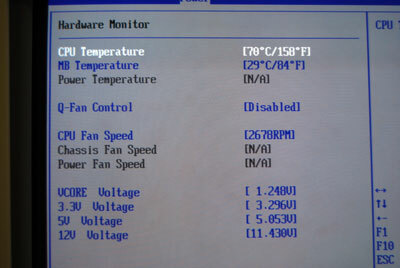 I searched the Internet to find out the maximum temperature my Pentium 4 3.0GHz can run at before frying itself. According to the report by Heatsink Guide, Intel Pentium 4 and Pentium 4 Extreme Edition CPUs have a maximum operating temperature of between 64 to 78 degrees Celsius (P4 EE 3.2GHz being at 64 degrees). I wonder if that means that my P4 3.0GHz has a maximum operating temperature of about 60 to 70 degrees too. I searched for a CPU temperature monitoring software and found SpeedFan 4.33. I installed it and configure it to display my CPU temperature in the taskbar. That way, I can keep an eye on the temperature at all times. I also configured the software to alert me when the CPU temperature rises above 70 degrees Celsius. The above is a screenshot indicating my CPU temperature. Temp2 is the temperature of my CPU. Do you notice the icon with a fire beside it? That indicates what 72 degrees Celsius does to my CPU. LOL. I notice the CPU fan is running at about 2657 RPM. I have no idea if that is normal. I wonder the CPU is overheating due to some dust collected around the heatsink and fan. I plan to give them a good clean up when I have the time. I hope that helps to reduce the temperature a little. This is a really late update. Last Thursday (1st November), I received a sorry note from PosLaju. The only thing I was expecting to receive is my Public Bank Visa Electron debit card. Since my debit card application was only processed a week ago, I wasn’t too optimistic about it. However, I was hoping that it was my debit card waiting for me. I quickly drove to the PosLaju office to pickup my letter. 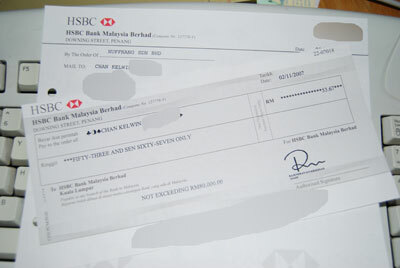 I was delighted to receive an envelope with the words “Public Bank Berhad” printed below my address. I knew it must be my debit card in it. So, it does take about seven working days to get a Public Bank debit card approved. Well, it is true if you do not include the time your application sit helplessly in a corner in the Public Bank office waiting to be picked up and processed. Anyway, I tried to add my new visa debit card into my PayPal account. Unfortunately, I was hit by an error message indicating that I couldn’t add the card into the system. I was furious and disappointed. I got the error message below. This credit card has been denied by the bank that issued your credit card. For details on why your card was denied, please contact your credit card issuer’s customer service department. Or, you may want to try adding a different credit card. I tried searching for a solution at Google and found LiewCF’s article on his Public Bank Visa Electron Debit Card. That was when I realized that I had to transfer more than the initial RM25 into my debit card because PayPal will charge a small fee (about US$1) to add my debit card. I immediately rushed to a nearby Public Bank to bank in RM50 into the card using the cash deposit machine. If you would like to transfer funds into your debit card through a cash deposit machine, remember to select the option “Credit Card Payment”. Insert your debit card number and check to make sure it is your name on the screen. After transferring the money, I went home and tried to add my Public Bank debit card into PayPal again. This time, it worked. I can now start to withdraw my hard earned PayPal funds and touch real cash. I have read some others advising us not to immediately withdraw a large sum of money or else PayPal may become suspicious and put our accounts on hold. After considering this matter for a while, I decided to withdraw the maximum allowed (US$500) instead. If PayPal does put my account on hold, I guess I will just have to go through the trouble to verify myself by sending in some documents. I am willing to take the risk rather than waste $5 for every extra transaction that I will do by making smaller withdrawals. I wonder if anyone else has made a large withdrawal (eg $500) from PayPal successfully without raising the alarm. Have you? I will be making the withdrawal right after this. Wish me luck!